Don Iovino, professional bass fishing legend, sonar and finesse expert, introduces his new worm color Mike’s Magic. Iovino has been making custom worms for decades. Devoted fans love his products, and Iovino is delivering what he calls his best color ever. When it’s ready for Iovino, then it’s ready for you! Named after a fishing buddy, constant revisions and adjustment went into Mike’s Magic until Iovino knew it was just right. Just recently at Castaic Lake California Iovino scored an 8.4-pound largemouth bass using the final version of Mike’s Magic. A salted soft plastic 6” straight tail worm, with a translucent under-belly and a darker back featuring purple, gold, and green fleck. The underside of the two-toned bait shows well on the worm at the top of the image. The belly of Mike’s Magic is clear. 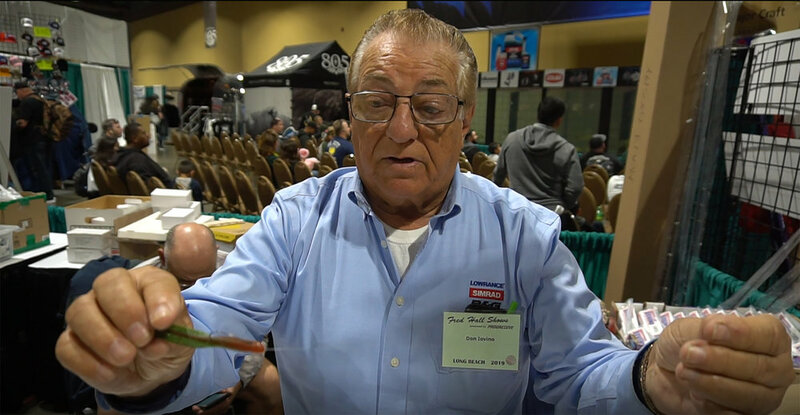 “This is key; the worm’s bottom is translucent in fairly clear green water, it stands out and gets the fish’s attention.” At this year’s Fred Hall Sportfishing Show, while Iovino was giving seminars at the bass tank, he explained the spooky bass would eat Mike’s Magic on every cast. 6-inch Straight Tail Worm held in the wacky position. A Carolina Rig is the way to go when fishing Reapers. For his Reaper set-ups, Iovino uses an Owner Cover Shot Worm Hook. The Cover Shot has a monofilament bait keeper that keeps the soft plastic Reaper from moving on the hook. Iovino says this is very important when dragging baits along the bottom. In Southern California ultra-light line finesse fishing is a staple for bass anglers. Opting for monofilament, Iovino doesn’t use fluorocarbon fishing line for any application with 8-pound test or lighter. Fluorocarbon is too delicate, says Iovino. If there is a kink in these light lines, you’re going to break the line and lose the fish. The cost of the line and the price of losing a fish doesn’t justify ultra-light line finesse techniques and small diameter fluorocarbon line. Iovino discusses Reapers, the pattern in the pic is Green Weenie, not Mike’s Magic. The Little Slugger in the new Mike’s Magic color sold out on the first day of the Long Beach California Fred Hall Show. Rig the Little Slugger wacky style, and with the slightest movement, the Little Slugger produces a pronounced wiggle. Iovino loves to fish the Little Slugger this way. You don’t have to shake hard, but you still get a lot of action, says Iovino. Iovino displays the Little Slugger in Mike’s Magic pattern. Mike’s Magic is available in the 6-inch Straight Tail Worm, 4.5-inch Fat Boy Straight Tail Worm, 3-inch Reaper, and the 3.25-inch Little Slugger Finesse Worm.